This is a corset for the wench who means business! The Armor Corset features the classic style of a typical wench corset with an added touch of high quality leather, giving this corset an armor-like quality. This corset is crafted from 9-10 oz. leather, featuring a classic shape with a look more akin to armor than clothing. 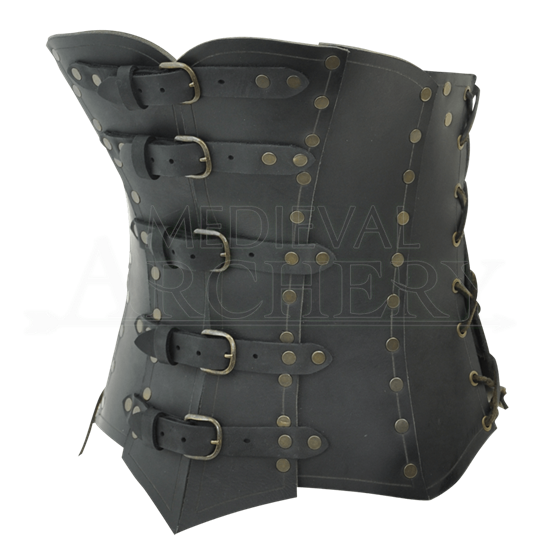 The front of the corset has five adjustable leather buckles and straps, which give the corset quite a bit of adjustability. The sides and back have corset-style lacing, which only further enhances the corset look of this armor. Not only is this armor great for women who want that fearsome wench look, but it is also a fantastic piece of armor for warrior-women, pirates, and more. Thanks to its leather straps, each corset size is rather adjustable. It is always best to order closest to your original size and then adjust for comfort and preference from there. This Armor Corset is a fantastic accessory for a woman to wear, taking the typical style and fashion of a medieval woman and transforming it into a warriors corset to be proud of, one that will keep wenches and warrior-women safe when they enter into LARP combat alongside their allies.